Recently I came across a website that I just love. I'm sure it is not new to many of you and I'm always a few steps behind in the blogosphere, but I'm thrilled to have finally found it. Tif of Dottie Angel is a very talented crafter and writer. She made this dress above, without a pattern, she just saw it in her mind and made it. 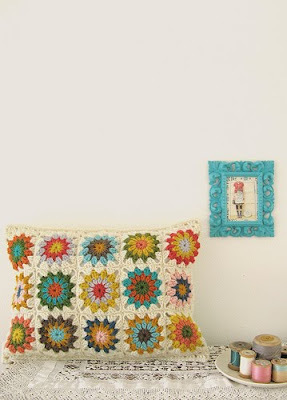 She is currently hosting a giveaway for this beautiful crocheted pillow that she stitched. 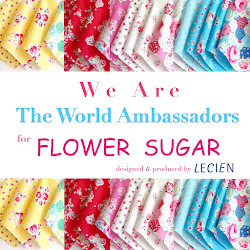 There are many free patterns and loads of inspiration on her blog. She also has a website with links to her store. 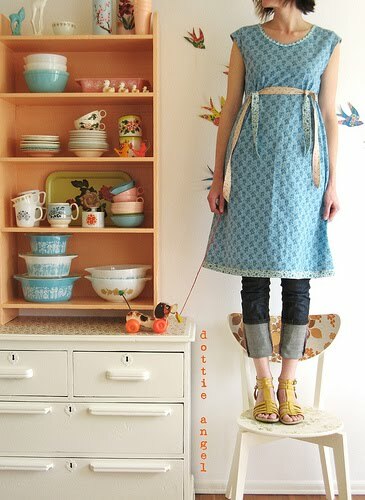 The aprons she creates from vintage pillowcases are amazing. She has a fun style and many of her pictures are taken up on chairs like the one above. I got a kick out of her "about me" page. I thought you might enjoy reading it too. I hope today brings sunshine, flowers, creating and joy! What a fun blog! Her aprons are so sweet! Thanks for a great link! I've not heard of her either! Thanks for the link, I'm heading over to check it out. Looks fun! Enjoyed, will have to check it out...but the fun part of stopping by today was hearing Twila Paris, "God is in Control"...I haven't heard it in years and was transported back in time, when I only had four children, and my 19 year old was little...thanks for the song. I had never seen Dottie Angel, I am so glad you pointed her out us. What a cute blog!